Bound by the Tibetan region of China to the north as well as India to the south, east and west lies the wonderful Himalayan country of Bhutan. This kingdom is one of the last places in the world where the Lamaist Buddhism is a state religion. Preserved through a rational development, Bhutan is home to magnificent nature, beautiful fertile valleys, large coniferous forests, enchanting Himalayan peaks and towering cliff clinging monasteries. At the heart of these dzongs, Bhutanese perpetuate their traditions expressing their faith through festivals that are organized annually. 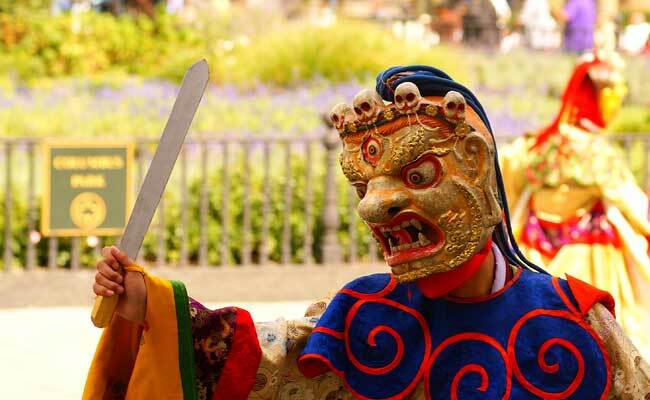 The Jambay Lhakhang festival and masked dances are an opportunity to learn more about this remarkable culture. According to the lunar calendar, the Jambay Lakhang festival dates range from the 15th to the 18th day of the ninth lunar month. It usually takes place in October or November. 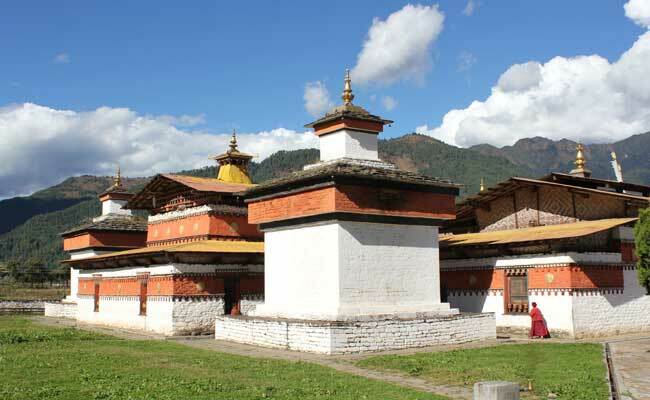 This year the great feast of Jambay Lhakhang is held from 27 to 30 October 2015. If you are planning to travel to Bhutan next year, dates are already fixed from November 14 to 17, 2016. In the central region of Bumthang, Jakar is the capital, which means “white bird” has its own dzong. Just a few kilometers of it, is a much larger monastery, which is Jambay Lhakhang. Jambay Lhakang is one of the oldest monasteries of the kingdom. It was founded by a Tibetan king in the seventh century, Songtsen Gampo. To outsmart the demons of the Himalayas, the king had to build 108 temples in one day. Two are in Bhutan one of which is Jambay Lhakang. The second is located in Paro, the Kichu Lhakang, which was built on the same day. Another legend has it that Guru Rimpoche visited several times Jambay Lhakhang and he considered it as a very sacred place. The first king of Bhutan, Ugyen Wangchuck Gongsa erected a great wheel of life inside the temple. The “Dus Kyi Khorlo” symbolizes the commemoration of his victory over rivals Punakha and Thimphu after the battle of Changlimithang in 1885. Part of the temple has a large statue of Buddha, the Maitreya Buddha of the future which, also called Jowo Jampa, hence the name of the monastery. It also have over a hundred statues of the gods of Kalachakra built by the first king in 1887. During the festivities, wild dances, called “Cham” and large bonfires celebrate the creation of this temple. For several days, dances and rituals follow one another to the sound of drums and cymbals while reliving gods and demons. It is a dazzling display of color and sound. The historic location lends itself perfectly to these annual festivities. Jambay Lhakhang is one of the most impressive festivals in the country. The first night, at midnight, around the fire, the monks perform their traditional naked and fiery dances in the proper sense, before the astonished eyes of the crowd. 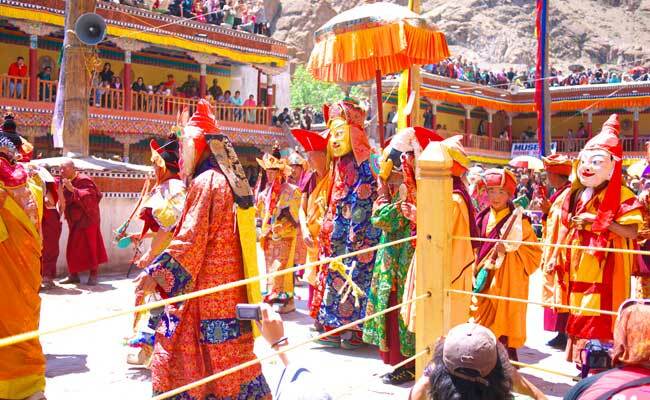 During the great annual festival, all locals, dressed in their best traditional attire, go to the dzong Jambay Lhakang to admire the monks swaying away the demons. The valley of Bumthang, the central region of Bhutan allows visitors to reach any part of the country. You enter the heart of an ancient culture. 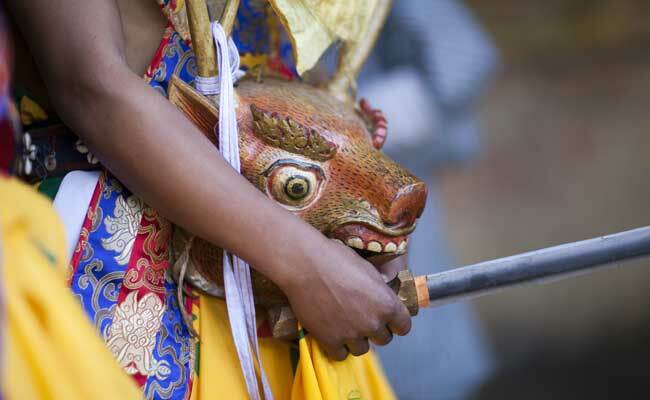 Festivals are extremely important ritual in Bhutan. Meeting and sharing is also the objective of such a spectacle. Your guide will introduce you with Bhutanese locales to initiate verbal exchanges and to learn even more about this great festival. We offer our travel in Bhutan generally from Paro, with an international flight from Delhi or Kathmandu. Other flights may arrive from Calcutta in India or Bangkok. Enter Bhutan from Assam in India by land and discover the eastern part of Bhutan, very authentic and preserved. Thanks to a custom-built route, you can choose to spend one or more days in Bumthang. Coming from the west, you can visit the famous cities of Paro, Thimphu and Punakha. Starting to the east, you cross Trashigang and Mongar. You are supervised throughout your trip by a driver and an English speaking Bhutanese guide. Hotels, transport and excursions are booked well in advance to guarantee your place in this period that attracts many travelers. Other events that await you are: the Punakha festival 17 to 19 February, 2016 and that of Paro, also very famous, the 19 to 23 March 2016. Do not waste time if you want to attend a festival in Bhutan, please contact us immediately.